Playstation Pro 1TB Console Red Dead Redemption 2 Bundle. Slick Interface : Fast, personal and easier to share, connect and play with friends. Pricing: The strikethrough price is the List Price. Spider- Man Crash Bandicoot N'Sane Trilogy. Sony Playstation 4 PS4 500GB Slim Black Console With FIFA 19 Bundle New. Dispatched with eBay delivery – Shutl 1 day. Box opened, my son started this once however did not actually play due to age and it is too complicated for him (age 6). We are selling as it is a gift that he cannot play with. See games for sale too. Receipt available on request. No returns. It is in very good condition and works great. Outlaws for life. 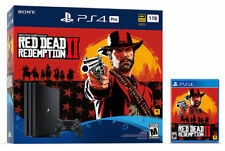 Experience Red Dead Redemption 2 in HDR quality graphics with this PlayStation 4 bundle. It contains content unsuitable for persons under 18 years old. Sony PlayStation 4 [ Model Black 500gb]. Format [ Sony PlayStation 4 ]. Battlefield Hardline. Killzone Shadow Fall. Sony PlayStation 4 PRO 1TB Rosso Redemption 2 console Dead Bundle + GIOCHI. Nuovo di zecca. Red Dead II (New). Gran Turismo Sport (Used). Sony PS4 Pro 1TB Black Console FIFA 19 PGA tour game - Jet Black Grade A . plus DualShock 4 wireless controller blue Condition is Used. Dispatched with eBay delivery – Shutl 1 day. Compensation will be added to the deliver company to cover cost. Collection bd18 is an option. Da quiz fulminei a esperienze multigiocatore coinvolgenti, i titoli PlayLink sono un capolavoro di social gaming che coinvolge ogni tipo di giocatore. Questo Bundle contiene TUTTI RIUNITI NEL GIOCO. Sony Playstation 4 500gb SLIM Model. Grab yourself a REAL Bargain. Deus Ex Mankind Divided. FIFA 18 Not Included. NBA live 14 / NBA 2K. Call of duty Advanced warfare. In Excellent Great condition with no issues and works perfectly. Sony PlayStation 4 1TB FIFA 19 Console Bundle - Jet Black. Condition is New. Dispatched with Royal Mail Signed For® 2nd Class. Sony Black original 500GB PlayStation 4 Console. Sony Playstation 4 Pro 1TB Black Console Bundle With 2 Games. This item is brand new never used however the box was opened to check contents. This includes the Fortnite Content! This bundle also includes 2 Games as follows: Assassins Creed: Syndicate. Middle Earth: Shadow of War. This item is available for collection. Bid/Buy with confidence. This item is available for collection from our store in Andover. You will never run out of space with this incredible 4TB Storage Play Station 4. It is a 4TB upgraded version with aditional storage. playstation 4 console bundle. Condition is Used. Dispatched with eBay delivery – Shutl 1 day. Sony PlayStation 4 Pro 1TB FIFA 19 Console Bundle - Jet Black. Condition is Used. Dispatched with eBay delivery – Shutl 1 day. Condition is used, but in mint condition. Sony PlayStation 4 Slim 500GB Black. 1x Power Cable. 1x HDMI Cable. PlayStation 4 Bundle of Games. Prey. Destiny 2 Gran Turismo. Technomancer. Prey and Destiny 2 have been played for about an hour so they are almost new and in almost new condition. Gran Turismo and Technomancer are new but not sealed. I will aim to post to the winning bidder within 2 days of receiving cleared paypal funds. Uk bidders only please. I always leave feedback. Any questions please feel free to ask. Many thanks for looking. THE CONSOLE IS IN VERY GOOD CONDITION, IT IS THE NEW SLIM CONSOLE IN BLACK. Sony PlayStation 4 Slim 500GB Glacier White Console Bundle. PlayStation 4 Slim 500gb console in white with leads - complete with box. The box has a tear. The bundle Includes Used very little. THE CONSOLE IS IN VERY GOOD CONDITION, IT IS THE NEW SLIM CONSOLE IN BLACK. ALL FULLY WORKING AND IN VERY GOOD CONDITION. Good condition ,Sony PlayStation 4 500GB FIFA 19 Console Bundle - Jet Black. Condition is good used with s few marks here and there but nothing major at all. Perfect working order, disc is scratch free. Fifa 19 Sealed Bundle. Experience the prestigious UEFA Champions League with HDR quality graphics in FIFA 19 on PlayStation®4. Three FIFA Ultimate Team ICON loan players on a five-match loan period. Recesso e Privacy. Condizioni di Vendita. DIRITTO DI RECESSO. Produttore: THQ Nordic. Peso: 508 g.
This year PES features 7 new league, with new stadiums, players and countries. With the Russian league exclusive to PES! PlayStation 4 1TB. The PlayStation 4 1TB console is a powerful gaming machine, with plenty of storage. Sony PlayStation 4 1TB Black. 1x Power Cable. 1x HDMI Cable. Murdered Soul Suspect. - The Order 1886. - The Walking Dead: A New Frontier.